Reflections on the biggest achievements and challenges of the year and looks to what’s in store for 2018. 2017 is officially drawing to a close and there’s certainly that end of year feeling in the ClearScore office. 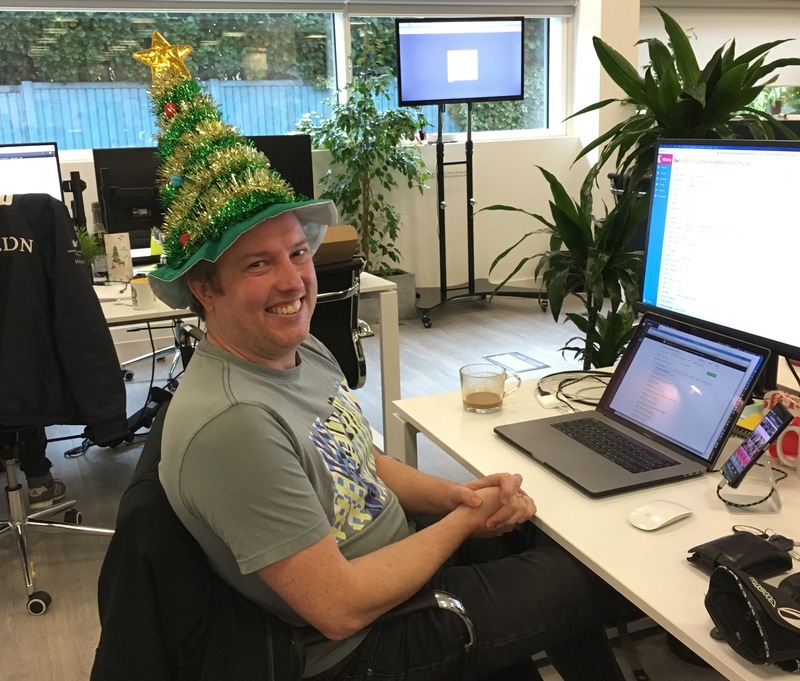 “Santa Baby” is gently playing in the background this morning, our Engage team are being noisy and André is wearing his Christmas tree hat. I’m hearing bottle tops being removed, not from beer but from soda water – clearly an attempt to feel better after the night before. Most of the team are away on their well-deserved Christmas break, and as I look at the banks of empty seats and screens all I feel is love for what we have created, the team we are becoming and the mission we are on. At ClearScore we are good at living the highs and lows of life. Encouraged by my example, we are an emotional lot and are very aware that we need to live the journey by celebrating our successes and learning from our failures – all of which we’ve done in plentitude over 2017. We’ve had a lot to celebrate this year from moving into a new office in Vauxhall, expanding our team, moving our infrastructure to AWS, and signing up our 5 millionth user – all big milestones for us. We’ve also put ClearScore in front of a whole new set of people, creating an experience for those in the UK without credit files, and also serving nearly 250,000 South Africans after we launched ClearScore in South Africa back in June. It’s been great to see how the team has pulled together to deliver some really demanding projects. We relaunched our mobile apps, have moved towards creating more personalised customer communications, and in the last quarter of the year made some big strides in really building our commercial pace. Speaking of the team, we’ve also had some classic ClearScore parties, most notably our 2nd anniversary conference in July. New relationships have started, we’ve had marriages and births to celebrate, and we were blessed to have our first female team member head off on maternity leave (go Hannah). We have all learnt a lot this year and have managed to have a lot of fun along the way. But as ever, the fun has also been intertwined with personal challenges and sadness. Team members have left, projects have gone wrong, some users have got frustrated, and we’ve had our fair share of arguments. Members of the team have lost loved ones, relationships have failed, and many of us have battled physical and mental health challenges. But these trials are easier to bear knowing that the environment here at ClearScore is one of support and love towards each other. This, above all, is the aspect of the company I am most proud of. If there is one thing that is certain for the year ahead, it’s that 2018 will be another year of mammoth change at ClearScore and in the industry as a whole. What we have done in the UK and now in South Africa too, is catalyse this change. Our business has forced larger companies than ours to change their strategy, but more important than that, it has delivered value, to millions, for free, forever. In doing we’ve helped to push personal financial services to become healthier and to work harder for you, the consumer. Whatever the future holds, each one of us at ClearScore is also a catalyst for this change. Whether that’s through focusing on serving our users with passion and dedication, creating our next feature, embracing open banking, giving our colleagues feedback, or pulling together to answer a business challenge, we are each an agent of change within the company and beyond. Our whole team has always used their smarts, their ability, and their energy to create great work and to try to change the market. Next year, we hope to do this on a bigger, global stage. Lastly, as the final chorus of Santa Baby fades, I have some thank you’s to say. To the ClearScore team – you are amazing and wonderful people and being part of your life journey is a privilege and an honour. I’d also like to thank your families – we are a demanding place to work and I know that sacrifices have to be made. To our board – thank you for all your support and advice through the year. And finally thank you to our users – the most important thing in this whole ClearScore operation. Please keep using ClearScore and sending us your feedback and ideas. Helping you work towards better financial well-being is our ultimate mission and your faith in us keeps us going everyday. I hope you all have a peaceful and restful Christmas holiday and a wonderful 2018. The Ashley Madison hack is fascinating, says Justin Basini, co-founder and CEO at ClearScore, as it raises interesting questions about morality, marketing and privacy. The Ashley Madison attack is the juiciest of all hacks so far perpetrated. This is not millions of dry boring credit card details only interesting to fraudsters. No, this is the details of 37m people who have, or want to have, affairs. Their details, including names, photos and even sexual fantasies could soon be up for public consumption.The group responsible for the hacking, the so-called ‘ImpactTeam’, have pitched this as a moral battle with them in the role of hero and Ashley Madison as the villains. The next few weeks will be fascinating to watch as the moral battle ebbs and flows. As the morality play progresses, there is also a marketing war going on and it is being fought over three main fields of battle: brand awareness, consumer proposition and trust. The hack has done amazing things for the Ashley Madison brand. Previously a slightly illicit brand, now millions more people have heard of it and even better understand its offer. If the hacked data is exposed to all there will also be millions of current users, lapsed users and suspicious spouses desperate to find out whether they or their partner has been exposed as a cheater. The publicity means Ashley Madison the brand gets an awareness boost and first interaction for “free”. Following the boost in brand awareness, the next test will be whether the consumer proposition is powerful enough to overcome brand distrust. What’s clear, whether you approve or not, is a platform which makes cheating more accessible is an attractive consumer proposition for some. But can it overcome the fact that any right-minded individual will now distrust the brand to keep their secrets? In our world now of ubiquitous Tweeting, Facebooking and data in the cloud, I reckon for many the hack won’t make a jot of difference. They will continue to sign up in their millions and take their chances. Once the acute coverage has died down, consumer irrationality will take over and they will conclude that Ashley Madison must have learnt its lesson and now be more secure and less hack prone. For lots of people, the power of the proposition will trump any brand distrust. Of course, there is also the possibility that this could tank the brand. So I bet in the back rooms of Avid Media, the owners of Ashley Madison, they are already hatching a plan to rebrand and use the power of increased awareness of the proposition to launch afresh. Surely this contingency planning would only be sensible? And finally what of the hackers? If you believe in their moral cause, then you should hope that they are pausing and thinking again about breaching the privacy of millions of not-so-innocent consumers. They may have the data but they don’t need to expose it. You might hope if you want to see the end of a platform for cheating that they should be planning a denial of service attack to stop the Ashley Madison service from actually working. This would be a much better way to achieve their aims but I suspect that really they don’t give a crap and just want to prove, yet again, that almost no IT system is hack-proof even those with the most salacious of personal information on them. Whatever side you take, moral or marketing, and I hope you’ll share them here, there is no doubt that how you handle the worst of disaster situations, both looking for threat and opportunity, is in our hyper-connected world a must-do rather than a should-do activity for all marketers. Just back from a trip to America and having spent far too long in airports over the past couple of weeks I was reminded of Jane Jacobs 1961 book The Death and Life of Great American Cities, and her powerful description of the ‘daily ballet,’ happening on the streets. The mass movement and information exchange between strangers going about their daily business which can be observed and felt on busy streets and places like crowded airports. Walking among strangers in an unfamiliar place has always had a certain piquancy to it…but these uneasy feelings are now more and more common even as we make our way around our own communities and countries. In airports the constant checks and universal CCTV and security presence makes one feel the oppression of the lack of trust in the travelling public and far from being reassuring it makes me feel on edge. It is this environment of nervousness and suspicion that makes it harder for us to be comfortable around each other and benefit from the formal and informal interactions of walking with strangers. Our response is to naturally spend more time alone or in close family groups, in our cars and homes and less out in our communities. We lose the sense of ourselves as citizens living together with others in society, and often replace this with other roles – like ourselves as consumers. And thus, marketing and many other businesses benefit as we replace community with consumption. The impact of these changing modes of interaction and atomisation of society are far-reaching. We trust less, we assume more negative intent and we destroy our very ability to trust, denying ourselves the opportunity to learn and interact with others, and in the process, blunt for good our skills in trusting. There is huge power in having control over your brand’s narrative and its evolution. To watch Steve Jobs delivering an Apple presentation about their latest product is to witness a brand completely in control of the development and evolution of their narrative. Don’t fall into the short-sighted trap of focusing on one campaign at a time, especially when the pressure is to acquire new customers or drive volume. Any new communication must be seen within the context of past and future promises. Understand and build on previous messages. Commit to and reinforce key benefits. Bring to life their mission, motivations and the culture through their actual achievements. These are the characteristics that help brands move forward and develop consistent space in people’s minds. Tony Langham, CEO of Lansons Communications, recently contributed an essay the Marketing Magazine supplement on PR. We chatted about the increasing need for integration between externally facing departments which I think is the future model of marketing and communications. Tony was kind enough to include some of my thoughts in his article…. In the next year, many of the remaining standalone big-brand PR and corporate communica tions functions will be absorbed into marketing departments, while those that remain separate will be much smaller than before. Some of this is driven by recession, but more is driven by a wider re struc ture of the marketing services industry that is gathering pace. In the past couple of months, Marketing has covered restruc tures at a diverse range of brands and companies, including USA Today, TUI Travel, Kraft, Dyson, HMV Group, Simple and The Co-operative. In future, marketing departments themselves may well transform or disappear, as organi sa tions move to a completely integ rated approach to stakeholder communication and engagement. He argues that this can be achieved by forcing closer collabor ation between brand, marketing, corporate communications, investor relations and CSR. At NS&I, where media relations has been integrated in mar comms for nearly 10 years, head of market ing and communi cations Tim Mack notes that the priority is now maximising ‘owned’ and ‘earned’ communica tions over ‘paid-for’. Many PR big-hitters believe the complete merging of PR into mark eting leaves gaps. Former Aon Communications head and consultant Paul Atkinson argues that integrated internal and exter nal communications to support change management require specialist skills. Another communi­cations director is more direct, claiming that ‘many marketing directors still don’t get PR’ and often find media relations challeng ing as they can’t control it. Another adds that market ing directors are rarely as experienced in handling reputational issues. Lundholm also raises the problems of confidentiality within a single function, recognising the need to balance social media know-how with skill in handling sensitive issues. Within FTSE-250 and FTSE-100 companies, we see less of a drive to complete integration as chairmen, chief executives and boards still value focused, discreet high-level counsel. The question is how big will these specialist, stand alone corporate communications functions be? In the longer term, there is good reason to believe that marketing services and customer communica tion silos will disappear to be replaced by cross-discipline func tions like customer engagement. Some question whether this is a step too far. Skipton Building Soci ety head of marketing Rachel Ramsden says: ‘Whether you’re called “Cust­omer Engagement” or “Marketing”, you’re likely to be doing the same things.’ She warns against the dangers of confusion and blurred responsibility in bigger functions. Williams is more philos ophical, observing that the trend to integ rate may be cyclical. ‘It’s fashion able to merge the teams now, as we start to understand communica tion in the content/SEO world and as marketing people learn to deal with earned and influenced media,’ he says. However, he sees no reason why the teams won’t move apart again in the future. My bet is on a more radical longer-term change, with smaller corporate communications func tions remaining at quoted comp anies and cross-discipline ones (customer engagement, govern ment relations, brand manage ment, distribution) replacing PR – and marketing – elsewhere. The question is which tradition al background – marketing or PR – has the requisite mix of skills to head the new functions. THE FUTURE OF UK RETAIL BANKING? I spent a morning last week judging the Financial Services Forum Awards for Marketing Effectiveness at the offices of Metro Bank‘s first branch in Holborn. This ambitious new player is the first new high street bank to launch in the UK for over 100 years. It is the brainchild of Anthony Thomson and Vernon Hill. Anthony brings a huge amount of experience from a career spent in advertising and communications and Vernon founded and built Commerce Bank in the US growing to over 500 retail branches. They have the pedigree to really challenge the UK market. Here are some snaps of the offices and branch. What was great is a real sense of the challenger brand going against the lazy ways of the incumbents. The branch is open, fun and the staff were even smiling. Vernon and Anthony were “on the floor” with Vernon’s little dog following around the office. It all looks great but I think the thing that will make the real difference are the ways that Metro Bank is being set up. There are many advantages that completely new businesses have especially in banking. From the infrastructure: no legacy systems to integrate with, all data on systems that can be scaled and are cutting edge; to the way that customer service staff work both on phone banking and in branch interchangeably. It’s these advantages that will make the real difference in delivering a truly better customer experience that might just get people to switch. And from what Anthony tells me new customer numbers are exceeding all their expectations – maybe the UK customer isn’t so inert when presented with something genuinely new, different and better. If you enjoyed this post then why not consider signing up to the RSS or email feed – it’s free and easy to do. Posted on September 7, 2010 November 20, 2012 Author Justin BasiniCategories Brand, MarketingTags banking crisis, banks, communications, financial services forum2 Comments on THE FUTURE OF UK RETAIL BANKING? We will extend our opening hours in our busiest branches: well this branch on the Strand was busy but their closing time was 4.30pm so no change there. In fact this caused one of the situations which impacted my experience – see the friendly service point below. We will aim to serve the majority of our customers within 5 minutes in our branches. I love this commitment because I can hear the meeting in my head when marketing took the Charter to the retail operations guys – you can bet the result of this meeting was the insertion of "aim" and "majority" in this commitment. Well yesterday Natwest might have taken aim but I was waiting in line for 18 minutes to pay in a cheque. We will provide you with friendly, helpful, service whenever you deal with us. The teller who deposited my cheque wasn't exactly brimming with the joys of summer but he wasn't that bad. However the man next to me got a shocking service. He turned up queued his 10 or so minutes and then presented the Natwest employee sitting on the other side of the glass with piles of cash. Her response, "Why are you here so late?" whilst rolling her eyes to heaven. I thought to myself why do you close at 4.30pm when every other shop on the Strand won't close until at least 6pm? This is a classic example of bank attitude: apparently the bank was doing the customer a favour by dealing with the cash. When will banks understand they work for us, especially true in the case of Natwest/RBS, rather than the other way round? We will actively seek your thoughts and suggestions on how we can become more helpful. Having depositing my cheque I thought I would seek to understand the Customer Charter a little more by asking the lady at the desk about these commitments. Perhaps she would actively seek my thoughts. So I asked "What is this customer charter all about then?" Given these commitments we might have expected her to engage enthusiastically with me about the journey the bank were on to provide helpful banking. Her response "Here's a leaflet". Any member of the Natwest/RBS team reading this, especially those responsible for the Customer Charter initiative, is likely fuming. Their anger will come from a sense of injustice that "this is a journey" and that the advertising is as much to their employees helping to set expectations, as it is to their customers. They will be upset that the internal communications they so lovingly created haven't been filtered down as they would have liked. They might be frustrated that the operational leadership "don't get it". But overall it won't really matter: the data will be made to look like service is getting better, the campaign is out there, and the initiative done. The next step on careers will have been made and if the commitments don't really make a difference then most likely the key people responsible will have moved on. Don't get me wrong, we need better banks. We desperately need retail banks to deliver on their core function which is to take deposits, lend to businesses and individuals, do this courteously, and make a fair margin. I make the point in this presentation that the case for innovation in banking at the moment is weak. Conceptually much of the Customer Charter is to be applauded. What is unforgivable is falling into the classic trap of promising before you can deliver. The customer experience reality is far from meeting these commitments; and until it is Natwest/RBS should shout a little less externally and focus internally a little more. They need to build trust and that is not done by making promises you can't deliver. Many of my real world friends who read this blog might be bored by me banging on about trust – so I apologise off the bat for this post. 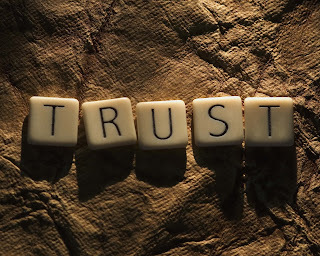 But quite few of my readers dropped me a line following my recent trust post about BT so I thought I’d share a few more insights from my research into the historical, economic, psychological and sociological research into why trust is important to human beings and their societies. I hope to create a dedicated site to this research soon. So if you have questions or thoughts on how businesses can build trust then please leave a comment or get in touch with me. I’d like to share three further insights into what businesses (and their brands) have forgotten about how trust works. 1. Trust is only built through dialogue. And the thing with dialogue is that is it two way. Most brands have forgotten that in order to have conversation you need to have a point of view, be interesting and have continuity. Make an (easy) imaginary leap that I am boring and suffer short term memory loss (but you don’t know that). Our first conversation won’t be good and the second, as I deny all knowledge of knowing you, has the potential to be positively damaging . Yet call the typical contact centre and you will be subjected to minutes of disclaimers telling you what can’t be discussed and then they have no knowledge of the 10 calls you’ve made before. Zip on the trust front. 2. We trust more in people than anything else. Everything else is an abstraction. Whatever the brand models and marketing literature say trust is fundamentally a human thing. Yes, it is possible to trust in brands, businesses, governments, organisations etc but the quickest and easiest way to build this is to get people to do the talking and the doing. The recent Toyota recovery press advertising covered this well. Whilst they might have handled the whole crisis poorly but this advertising with its premise of “we are thousands of people working as hard as we can to recover the situation” was fundamentally human and powerful. 3. To be trusted, you need to trust. Every brand I’ve worked with wants people to trust them – that’s the point of brands right? Yet most businesses and their processes don’t trust the customer. Businesses too readily default to a position of policies that cater to the downside risk of fraud and loss rather than trust their average customer. You’ve banked with a high street bank for 40 years with a perfect record but retired last year. Try asking for an unsecured loan – 40 years counts for nothing – policy says “we don’t trust you”. If you want to build or rebuild trust you could do worse than allow your humans to be human. As ever thanks for reading…..
Posted on March 16, 2010 November 28, 2012 Author Justin BasiniCategories Book, Brand, TrustTags brand strategy, communications, financial services, insights, relationships, repairing, repositioning2 Comments on GO ON TRUST ME….. This morning Cadbury, the UK multi-national confectionery manufacturer, and Kraft, the US based multi-national food conglomerate, announced they had agreed the much contested takeover bid for £11.5bn. I am a consumer and shareholder of Cadbury. Food brands are all about trust, and chocolate even more so because it is an emotional category. Cadbury is an iconic British brand with a rich and socially aware history. In its early days Cadbury was a major employer of women and had a paternalistic attitude to its employees (in a good sense) investing in their welfare. Cadbury is one of the most trusted brands especially in the UK regularly coming in the top 10 of brand trust surveys. Even this morning on it's website the headline graphic was "values led, performance driven". Is Cadbury's history of commercial success in a social context important or relevant anymore? @urbanfly tweeted this morning "There's a romantic idea that Cadbury is a Birmingham company. They're a global corporation who buy out other companies". Whilst Cadbury is a global corporation I believe that history is an important part of the embedded value of any company. Brands are created by people and their actions. And the mythology of a company is important as an implicit guide for those making decisions, providing a different perspective or a pause for thought. Of course there is another side of Cadbury. They benefited hugely from the British Empire, but more recently have been a huge buyer of FairTrade commodities especially in West Africa. A descendent of Cadbury's founder called the takeover "a horror story" according to the BBC. Felicity Loudon, George Cadbury's great-granddaughter said, "Every single iconic brand is going – we sell out everything." Of course this isn't important in of itself but I think it is the attitude that many will feel as we see this great British company consumed. The takeover has been justified because the companies want to secure growth and save cost with now warm words between the parties saying how the best of Cadbury will be retained. But I doubt this will happen. I've worked on both sides of the fence being acquired and acquiring in my corporate career. Cultures rarely merge well. The company taking over inevitably dominates and imposes its values and decision making processes. What all this means is a challenge to the very logic and price paid for the takeover by Kraft of Cadbury. Another reload of the Cadbury website this morning proclaimed "creating brands people love". And here is the rub….of the £11.5bn paid a major part of this will be goodwill. A major part of this goodwill will be the intangible value of the Cadbury brands. From the reaction on Twitter and in the press the destruction of this goodwill has been palpable already. The provenance and corporate background of brands is increasingly important to people. In our transparent society information on the companies that make the brands "we love" is so much easier, we know their stories and a sense of where they come from. The fact that Cadbury has been promoting its use of FairTrade in advertising is all about proving they are true to being led by their values. Given the arguments over the deal, the context of the UK economy and the shameful collapse in manufacturing in the UK's manufacturing base over the past 20 years this takeover will get a huge amount of coverage both now and in the future. The result for consumers will be the perception, even slight, that their bar of Dairy Milk is less satisfying than it was before. Even if the taste of the chocolate stays the same (a big topic on Twitter! ), the "taste" of the brands will be tainted for ever. There is no doubt that a great British company and brand died this morning. What's your view? Do you think the takeover will destroy or create value? Comment now!